[ Llewellyn's first-hand experience: Glued together at various angles from aluminum-styrofoam thermo-panel slabs, it was a huge box 8½ feet wide, 17¼ feet long, 9¼ feet tall, with a wheelbase over a half-foot shorter than its height, which made for idiosyncratic handling at best. Thus "Leaping Lena" became our term of endearment for her, superceding the name selected by the previous owners, which they'd spelled out in bronze aluminum parallelogram adhesive letters applied by the entrance door: "CATSAROAMA" — which always made me wonder if their felines had wanderlust or poor hygiene? 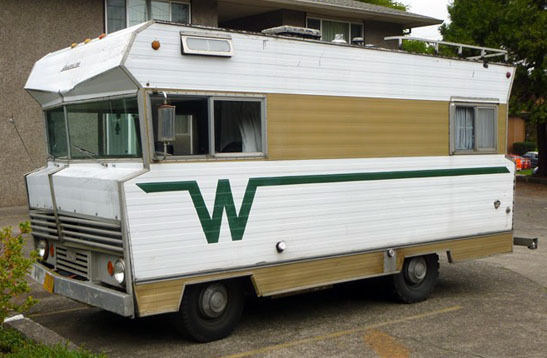 This Winnebago was a truck, no doubt, with a large flat steering wheel and a snarling disposition. A pitiful gas tank and heavy thirst made it seem like you were constantly in search of the tall gas station signs at the exits of Interstates. More than once, it didn't make it. In the icy winter while you were stopped at a traffic light, you had to shift into neutral, otherwise the transmission would overcome the timid rear brakes and you'd find the tail creeping sideways like a dragster. Personally, I didn't like its karma; too many bad things happened within its aura. One notable incident was late at night on a piece of I-95 in Virginia, shortly after I'd taken over the driving shift from Dad on a trip home from the South. I had reached the speed limit (then) of 70 or 75, and was cresting a hill in a deserted woodsy area. An old VW beetle was straining to pass me, hesitating as it tried to break through my bow wave. As it finally got beyond and started return to the driving lane, it twitched a little, side to side. I had a perfect view through the Winnebago's giant flat windshield of the VW's swing axles tending to fold under the car as its twitches became spasms and over-corrections. After several increasingly alarming swerves at top speed, it flipped onto its side and skated down the Interstate, showering me with sparks. Meanwhile, I was trying to bring the 'Bago to bay with its feeble drum brakes while avoiding contact with the spectacle of unfolding mayhem to which I was front row center. After an eternity of screeching, pedal pounding and fireworks, we all came to rest on the shoulder about a half mile down the road, the VW having flipped, catlike, back onto its wheels at the last moment! A thoroughly terrorized college student scrambled from the car, with tears aflowing and asking where her kitten went. As state police arrived we continued on, silently wishing luck to the feline search party and vowing to forever steer clear of swing axles. Then there was the time my father slipped on the ice in a parking lot, dislocating a shoulder, and had to drive himself one-handed in this behemoth to the hospital emergency room. In 1971, it also presided over an ugly breakup with my girlfriend in New Paltz (an expanding event which enveloped the Fiat 850 in the process). Towards the end of this evil spell, the Winnebago-Ford decided to take over control from my father on an Interstate somewhere in Ohio, swerving violently back and forth across several lanes before he could bring it to a stop on the shoulder. In the process, my mother, who had just unbuckled her seat belt to get up and brew a cup of instant coffee or go to the john or something, was so knocked around the cabin that her back received long-lasting injuries. She became a seat belt addict thereafter. And Leaping Lena's days were numbered. You all remember the Winnie (and do it with a kiss, a sigh is just a sigh. . .) The time went by and there was the. . .